Whether you do a good bit of hiring in your organization or spend little time at the task, you’ll enjoy the features of ZuzuHire. ZuzuHire is a multimedia screening tool that enables businesses or human resource agencies to screen and hire candidates faster and with more efficiency. On ZuzuHire, you simply write down the questions for the interview, and make a selection as to how you want potential job candidates to reply. Choose from multimedia choices, such as voice, video, essay or multiple choice. If you don’t have time in your busy schedule to talk to individual applicants, then you’ll find great comfort in knowing ZuzuHire is your personnel assistant. For example, if you are screening potential employees, connect your prepared interview to a job posting for your company. Applicants who provide their qualifications will answer the interview questions through an established platform. Also, if you want to avoid speaking on the phone with candidates, you can choose to interview, again, via ZuzuHire’s platform. Write down the interview questions and send them by email for candidates to conveniently fill out in the comfort of their home. Needless to say, the employment screening tool is an excellent way to cut down on the time it takes to interview people and review their qualifications. Employment agencies can also take advantage of the candidate presentation tool on the ZuzuHire site. Not only can you supply the applicant’s resume to a client, you can include the multimedia interview as well. No doubt, you’ll be well-remembered as your company’s brand colors and logo appear online too. As you can readily incorporate the interview in the posting for the job, you’ll be able to speed up the process and generate some extra time where you can carefully peruse each resume and multimedia interview in order to make a choice. This type of screening makes candidates a lot less nervous about applying and the employer much more confident about his eventual decision. 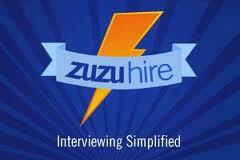 ZuzuHire is a multimedia interviewing tool that makes it easy to screen and interview job candidates online. ZuzuHire’s easy-to-use app allows you to conduct multimedia interviews or online interviews with the use of video, mock phone screens, essay questions, and interview questionnaires.